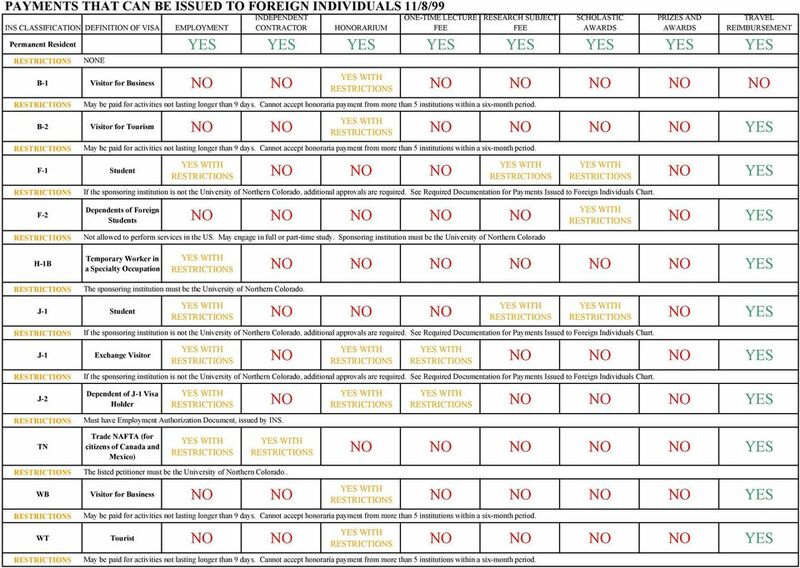 Download "ONE-TIME LECTURE FEE YES WITH RESTRICTIONS YES WITH RESTRICTIONS YES WITH RESTRICTIONS NO NO NO"
2 Permanent Residence No restrictions, treated as US citizens. 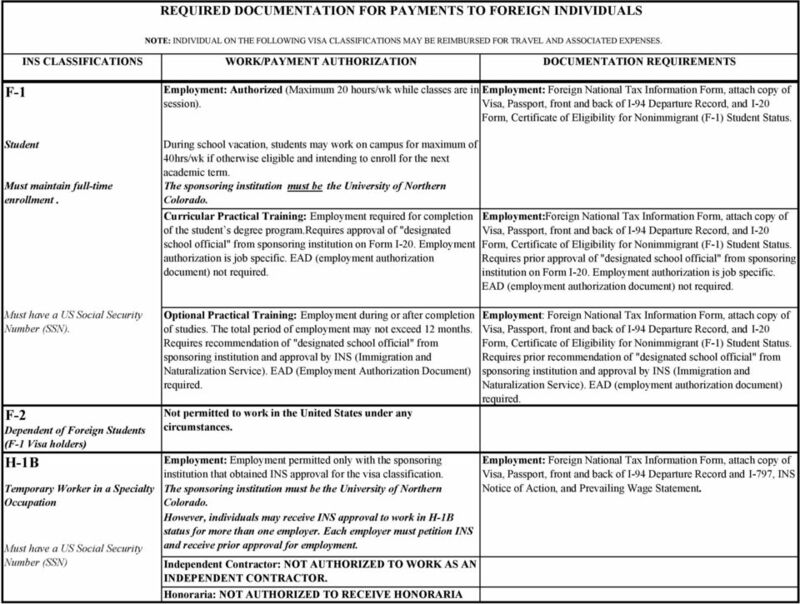 Employment: Foreign National Tax Information Form, attach I-551 Card (Permanent Residence Card) OR I-551 Stamp, temporary evidence of lawful admission for permanent residence, must be currently valid, employment authorized until expiration date. Must have US Social Security Number(SSN) Independent Contractor/Consultants: Foreign National Tax Information Form, attach I-551 Card (Resident Alien Card) OR I-551 Stamp, temporary evidence of lawful admission for permanent residence, must be currently valid, employment authorized until expiration date, and Independent Contract Agreement. Consultants Charged to Sponsored Programs: Foreign National Tax Information Form, attach I-551 Card (Resident Alien Card) or I-551 Stamp, temporary evidence of lawful admission for permanent residence, must be currently valid, employment authorized until expiration date, and Independent Contract Agreement. B-1 Visitor for Business OR a Individual B-2 Visitor for Tourism Academic Honoraria:May be paid for Honoraria not lasting longer Academic Honoraria: May be paid for Honoraria lasting not longer Visa, Passport, front and back of their I-94 Card Departure Record and Honoraria Agreement. Agreement. 3 F-1 Student Must maintain full-time enrollment. F-2 Dependent of Foreign Students (F-1 Visa holders) H-1B Temporary Worker in a Specialty Occupation Employment: Authorized (Maximum 20 hours/wk while classes are in session). During school vacation, students may work on campus for maximum of 40hrs/wk if otherwise eligible and intending to enroll for the next academic term. Curricular Practical Training: Employment required for completion of the student s degree program.requires approval of "designated school official" from sponsoring institution on Form I-20. Employment authorization is job specific. EAD (employment authorization document) not required. Optional Practical Training: Employment during or after completion of studies. The total period of employment may not exceed 12 months. Requires recommendation of "designated school official" from sponsoring institution and approval by INS (Immigration and Naturalization Service). EAD (Employment Authorization Document) required. Not permitted to work in the United States under any circumstances. Employment: Employment permitted only with the sponsoring institution that obtained INS approval for the visa classification. However, individuals may receive INS approval to work in H-1B status for more than one employer. Each employer must petition INS and receive prior approval for employment. Honoraria: NOT AUTHORIZED TO RECEIVE HONORARIA Employment:Foreign National Tax Information Form, attach copy of Requires prior approval of "designated school official" from sponsoring institution on Form I-20. Employment authorization is job specific. Requires prior recommendation of "designated school official" from sponsoring institution and approval by INS (Immigration and Naturalization Service). EAD (employment authorization document) required. Visa, Passport, front and back of I-94 Departure Record and I-797, INS Notice of Action, and Prevailing Wage Statement. 4 J-1 Student Must maintain full-time enrollment. J-1 Exchange Visitor Employment: Authorized (If the sponsoring institution is the University of Northern Colorado)Maximum 20 hours/wk while classes are in session. Academic Training: Eligible for 18 months of training following completion of their program. Must obtain prior written authorization from Responsible Officer of their Designated Program sponsor. Postdoctoral Training: Eligible for 36 months of training following completion of their program. Must obtain prior written authorization from Responsible Officer of their Designated Program sponsor. Employment: Employment permitted only with the sponsoring institution that obtained INS approval for the visa classification. Colorado Honorarium & One-time Lecture Fee: If the sponsor is not UNC, prior written permission must be obtained from the sponsor. Form, Certificate of Eligibility for Exchange Visitor (J-1) Status. Form, Certificate of Eligibility for Exchange Visitor (J-1) Status. 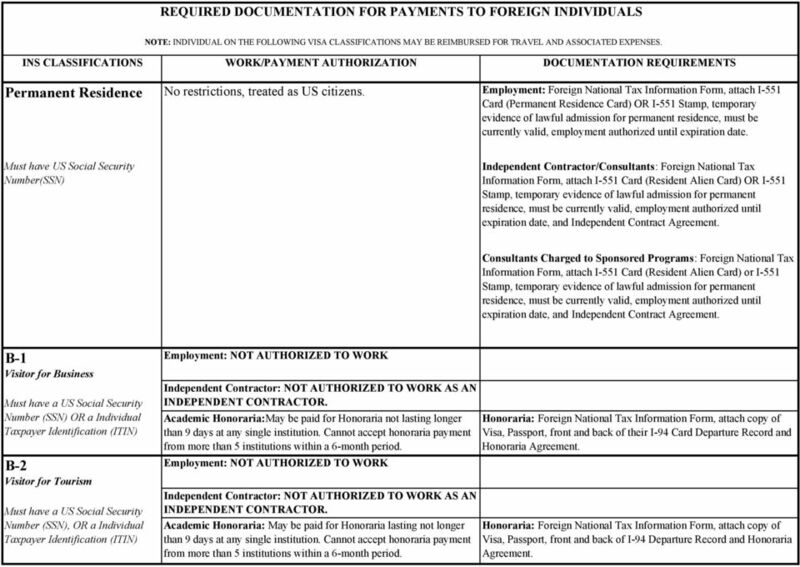 Non-employee Fellowship: Foreign National Tax Information Form, attach copy of Visa, Passport, front and back of I-94 Departure Record, and IAP-66 Form, Certificate of Eligibility for Exchange Visitor (J-1) Status. Form, Certificate of Eligibility for Exchange Visitor (J-1) Status. Copy of written permission from the sponsoring institution must be attached. Honorarium & One-time Lecture Fee: Foreign National Tax Information Form, attach copy of Visa, Passport, front and back of I-94 Departure Record, and IAP-66 Form, Certificate of Eligibility for Exchange Visitor (J-1) Status and Honoraria Agreement. Copy of written permission from the sponsor must be attached. 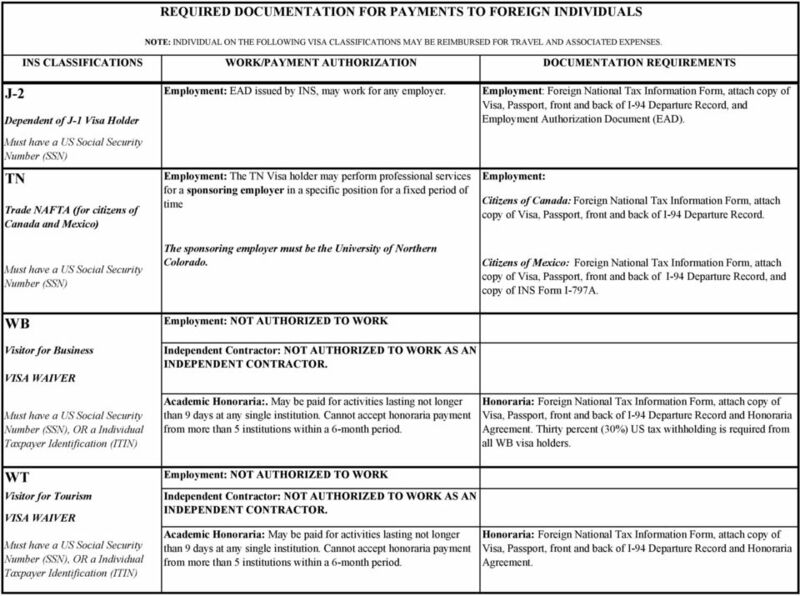 5 J-2 Dependent of J-1 Visa Holder TN Trade NAFTA (for citizens of Canada and Mexico) Employment: EAD issued by INS, may work for any employer. 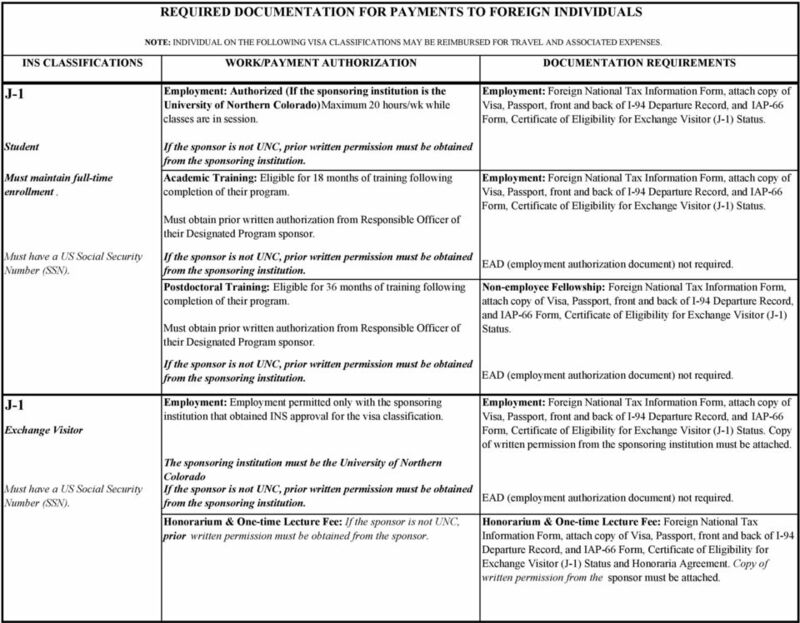 Employment: The TN Visa holder may perform professional services for a sponsoring employer in a specific position for a fixed period of time The sponsoring employer must be the University of Northern Employment: Visa, Passport, front and back of I-94 Departure Record, and Employment Authorization Document (EAD). Citizens of Canada: Foreign National Tax Information Form, attach copy of Visa, Passport, front and back of I-94 Departure Record. Citizens of Mexico: Foreign National Tax Information Form, attach copy of Visa, Passport, front and back of I-94 Departure Record, and copy of INS Form I-797A. WB Visitor for Business VISA WAIVER Academic Honoraria:. May be paid for activities lasting not longer Agreement. Thirty percent (30%) US tax withholding is required from all WB visa holders. WT Visitor for Tourism VISA WAIVER Academic Honoraria: May be paid for activities lasting not longer Agreement. ACCOUNTING MANUAL Page 1 TAXES: FEDERAL TAXATION OF ALIENS Contents Page I. Introduction 4 II. Definition of Resident Alien and Nonresident Alien 4 A. Green Card Test 5 B. Substantial Presence Test 5 C.
Employment Tax Consequences of An International Workforce Moving Employees Into And Out of the US.